How sweet is this handwritten love letter gift wrapping paper? A great way to get creative for your future spouse! Write a love letter out and use it to wrap a gift to each other before your big day! Definitely something to keep on your list! This would also be a great way to send a gift to your mother, maid of honor, and bridesmaids. Check out the simple steps here! 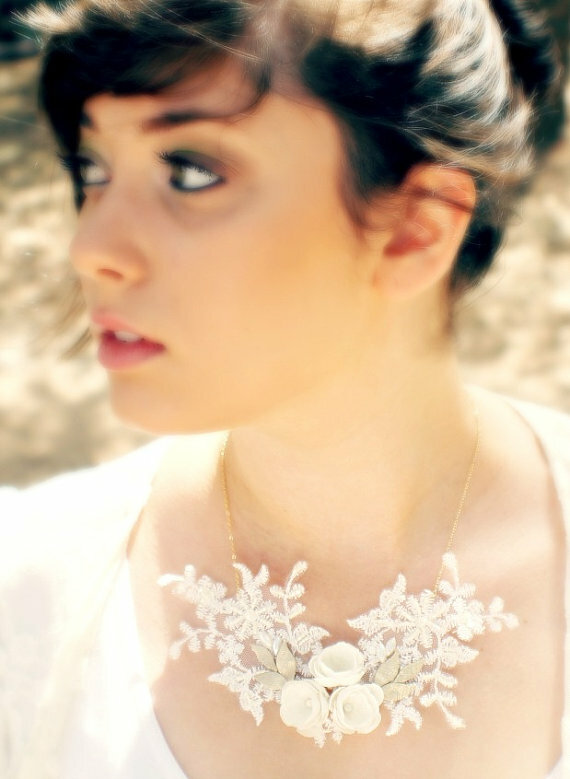 Love this intricate handmade necklace! 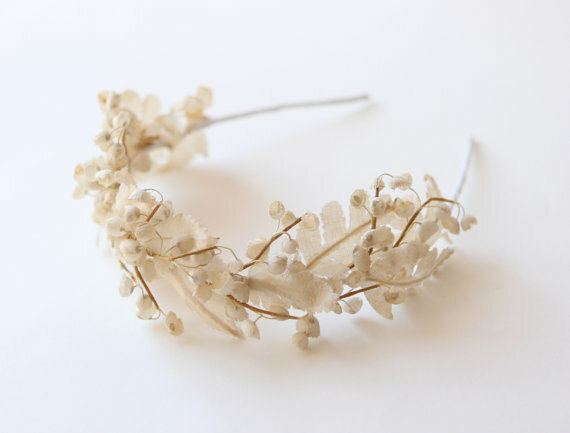 It’s almost like having a unique flower snowflake on each bride’s necklace – each one being one of a kind. Aren’t we all? Perfect for a winter wedding! 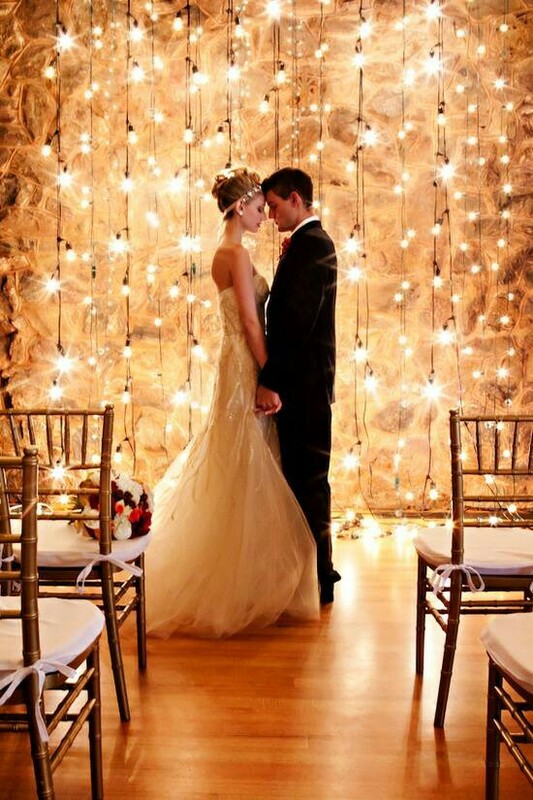 Loving the beautiful backdrop of lights, the bride and groom sharing an intimate moment, and her cute head band – everything about this photo is gorgeous and breathtaking! Now that the cold weather has taken over, we crave romance, warmth, and love – what better to fantasize about than a beautiful winter wedding? Remember our Winterland of Wonder inspiration board? This week, we gathered some photos of brides in winter weddings showcasing different styles and vibes, but all sharing one common theme: romance. Enjoy! 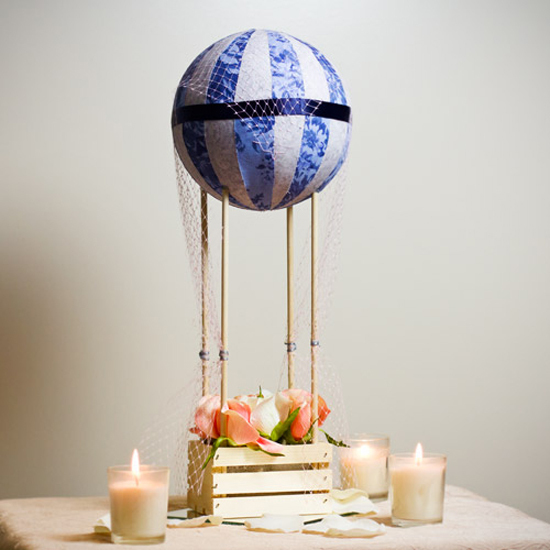 How beautiful is this handmade DIY hot air balloon centerpiece? Traveling is such a romantic theme for weddings! And I must say, this centerpiece makes you want to hop in and get away! 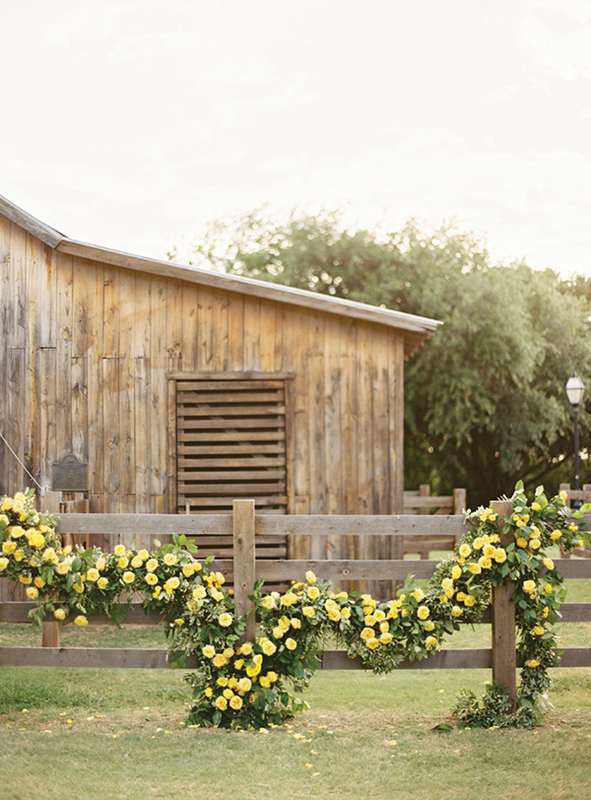 Loving this beautiful yellow rose garland! This would be gorgeous at any wedding with any color theme flowers. The key is to keep the garland thick and to arrange it in an organic fashion that has no symmetry! 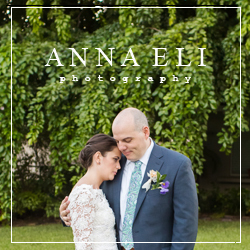 Find other photos from this romantic faux wedding gallery here! The weather outside is getting colder and colder so it calls for a classic theme board – Winter Wonderland! This timeless and romantic wedding theme uses the beautiful elements of winter with intricate textures and forms to create an illusion… almost like a fairy tale. How pretty is the cotton stalk bouquet?! 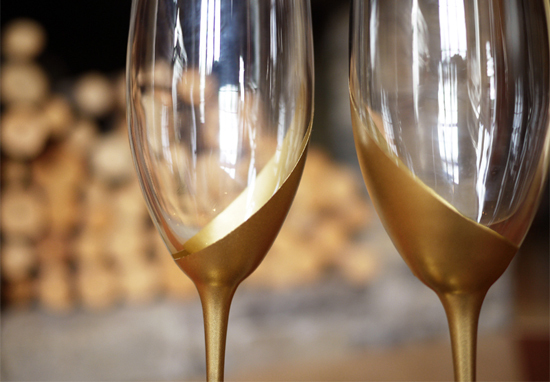 Mmm, the gold-dipped look is so romantic and beautiful! 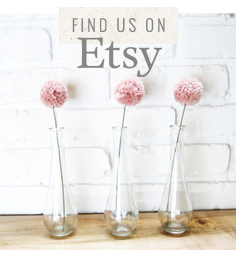 This would be a perfect diy project to make the sweetheart table glassware a little more special and personal at a wedding! And of course you’d need to get a photo of the new couple sipping champagne together. Clink! Follow the easy steps here! Remember the wool love bird cake toppers? 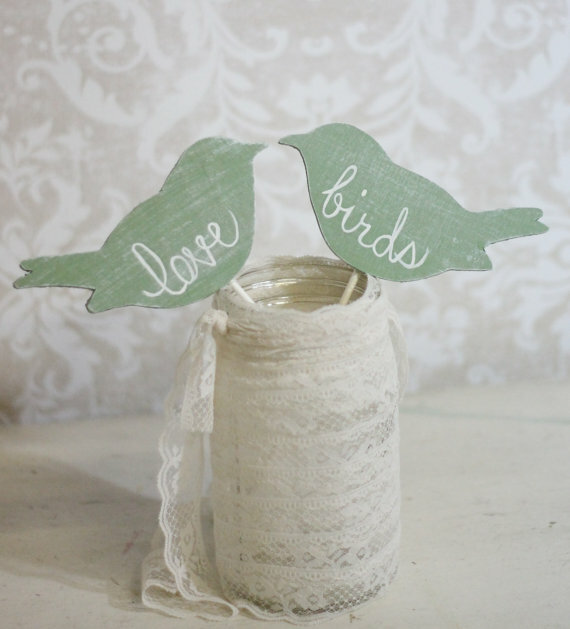 How adorable are these wooden love bird cake toppers? Very!